The battle royale continues as the world's greatest superheroes are forced to fight each other to the death in a mysterious, otherworldly prison. Who will be crowned the victor in this month's grudge match? More importantly, who will be the loser? And will the cabal of Sable, Meridian, Sol Invictus, and the Manchurian be able to decipher the mysteries of the prison before one of them is selected to enter the arena? 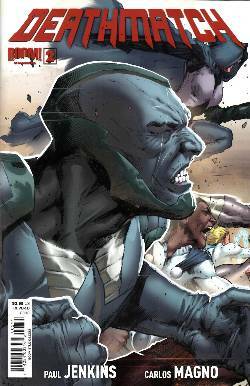 Written by industry legend Paul Jenkins (SENTRY, INHUMANS) and drawn by comics superstar Carlos Magno (PLANET OF THE APES, TRANSFORMERS), DEATHMATCH is a dark, psychological deconstruction of the superhero genre that can't be missed.